Should Magento be Your Go-To Platform for E-Commerce? Home ⟩ About Fruition ⟩ Blog ⟩ Should Magento be Your Go-To Platform for E-Commerce? Magento is a fairly new e-commerce shopping cart that made its debut in 2008. Since then it has quickly become one of the leading e-commerce platforms used on the web today. 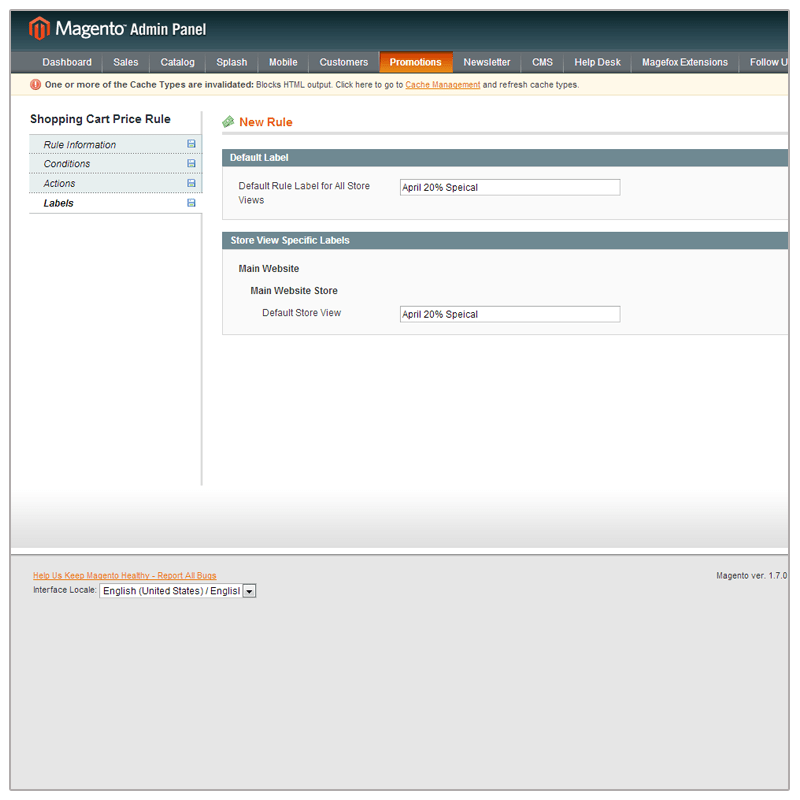 Magento offers two paid versions, MagentoGo for small businesses and Magento Enterprise Edition for larger corporations. Magento also offers a free and open source version called Magento Community Edition. 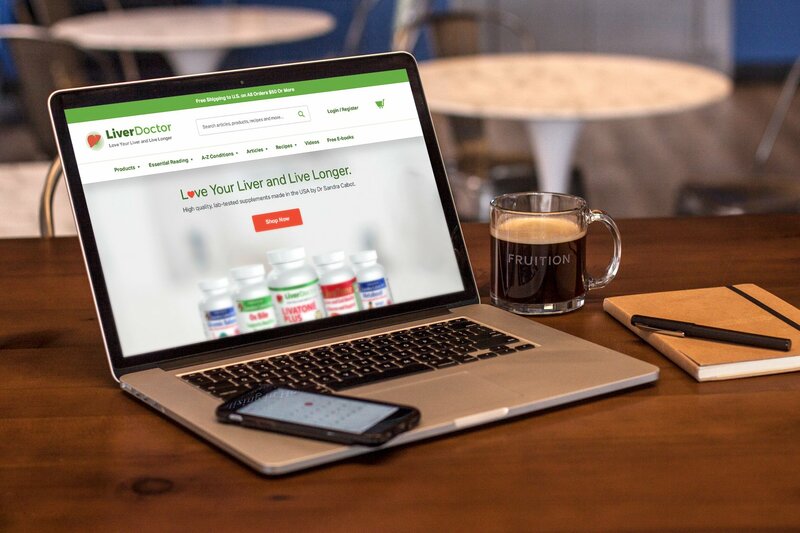 We’ve found the Community Edition extremely adaptable and able to meet the needs of the majority of our customers who are looking to upgrade or create a new online retail shop. Because it is open-source, many great extensions have been created to extend the functionality of the Magento Community Edition. However, without any upgrades, Magento still offers an impressive list of features out of the box. 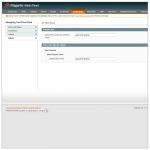 Payment Gateways – A group of pre-installed payment gateways are included in a fresh Magento install, including Zero Subtotal, Authroize.net, Google Checkout and PayPal. Additional gateways are supported through 3rd party extensions or can be custom coded if needed. Shipping – Magento is built with USPS, UPS, FedEx and DHL shipping calculators that allow store owners to always offer up-to-date weight based shipping prices for customers at checkout. Store owners can also set up table based shipping rates dependent on weight, price or quantity. Gift Cards and Coupons – Magento has built in functionality for both of these. You can easily assign gift cards or coupon codes in a number of different ways to increase conversions. 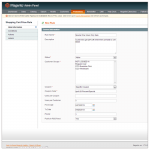 Catalog Rules Discounts – Magento has the ability to set pricing rules based on specific product attributes or prices. An example would be running a special on any item in your store over $150. 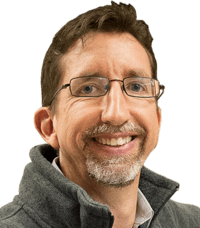 This can be created as a special that requires the customer to have a unique coupon code or it can be applied to any product from the store’s catalog that fits the criteria. You have the ability to schedule these specials to begin or end on a set date and time or they can run indefinitely. Magento makes it easy to save specials and reuse them at any time in the future. Cart Rules Discounts – These discounts are similar to catalog rules, but apply to specific details of a customer’s shopping cart. For example, if a customer spends over $300 they get a set percentage or fixed price discount, or maybe free shipping. You have the ability to start and end these specials at a set date and time and can save specials and reuse them at another time. Step one for creating a new cart rule in Magento. Pick a name, date and group the rule effects. 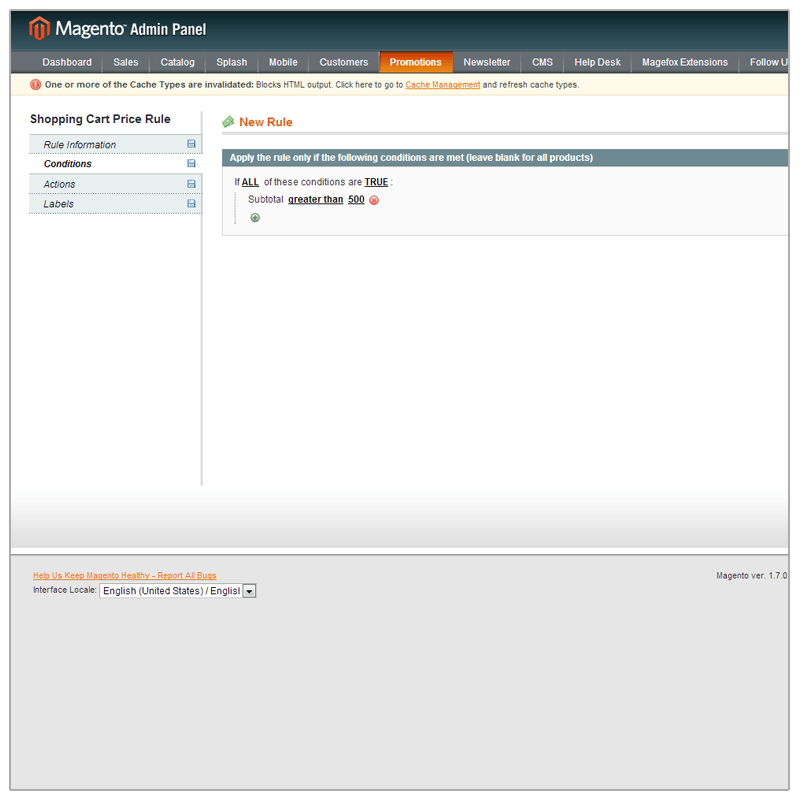 Step two for creating a new cart rule in Magento. Choose the conditions that need to be met for your customer to receive their discount. 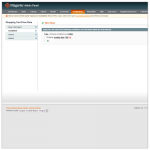 Step three for creating a new cart rule in Magento. Define the discount that will apply to the customer if their cart meets the requirements. 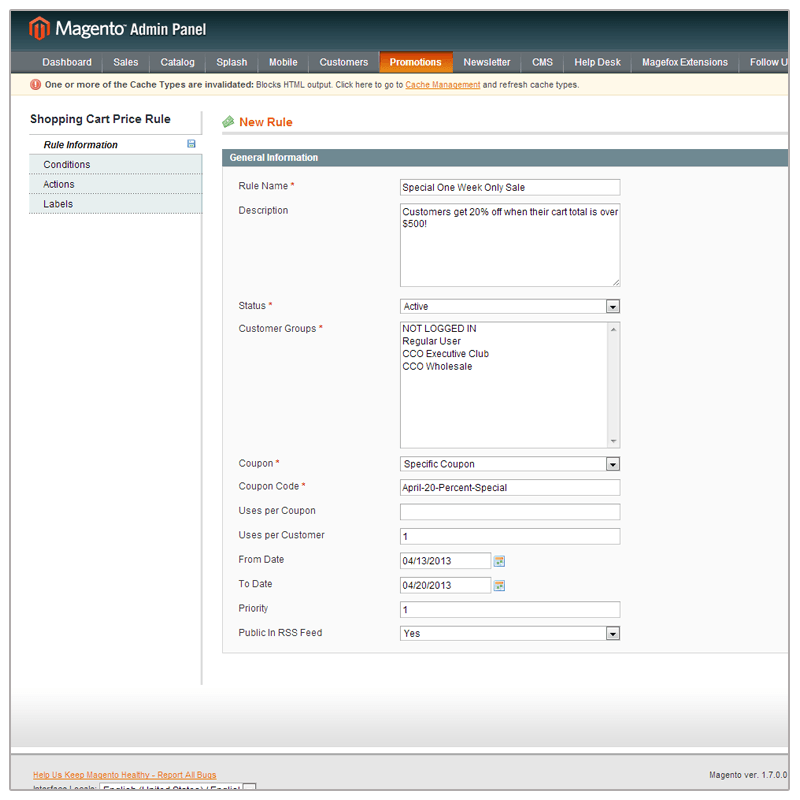 Step four for creating a new cart rule in Magento. Create labels that you and your customers will see so you can keep track of how many discounts have been used. Customer Groups – Magento allows for specific customer groups to be created, for example: Retail, Wholesale and Distributor. Each group can have their own pricing, benefits and tax class. You can also run promotions that target specific customer groups as well. 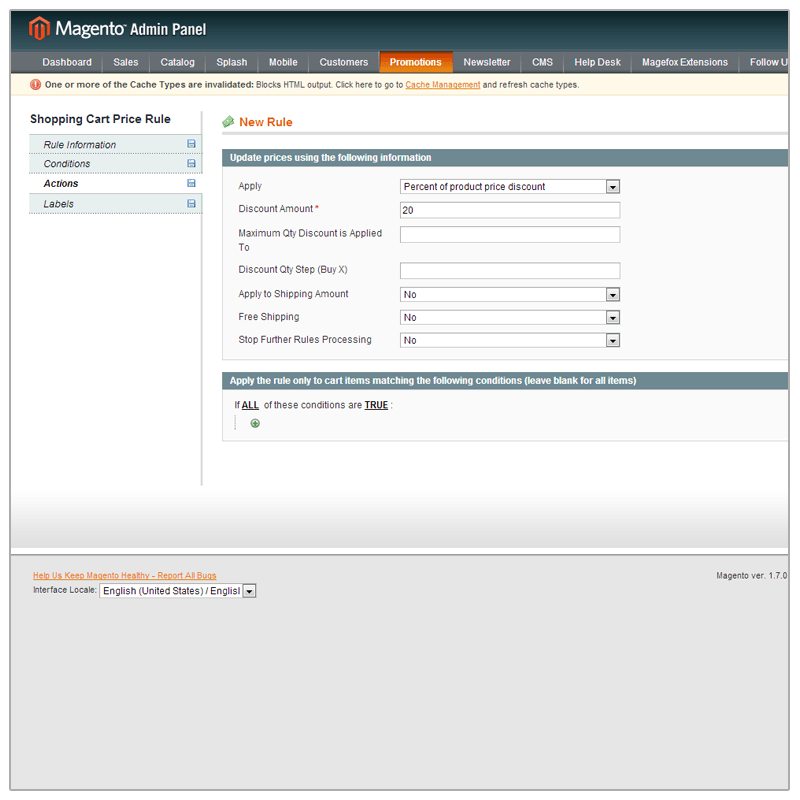 Multi-Store Setup – Magento is very scalable. With the community edition of Magento you have the ability to run multiple stores on one Magento installation and you can share products between the different stores while assigning different prices, languages, product descriptions, product names and many other attributes for each store view. Cross Sells / Up Sells – By tagging products and associating them with other products Magento allows store owners to create blocks throughout the site that will allow you to market additional products that customers might also be interested in or that complement/add to products already in their cart. Layered and Filtered Navigation – Magento has a very powerful layered navigation system. 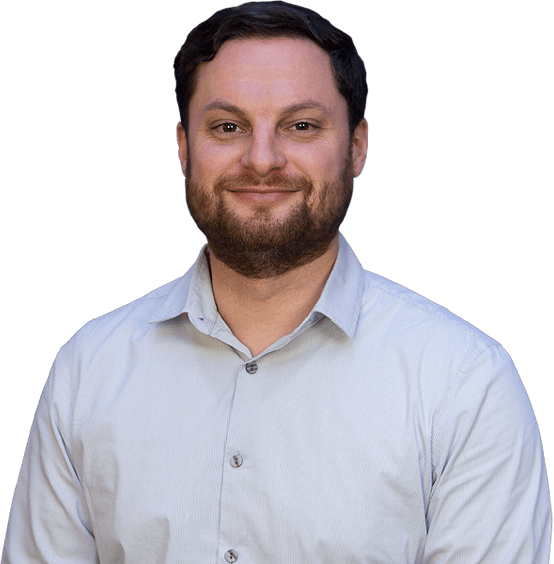 The categorization of products and all the attributes assigned to products automatically become ways in which we can build navigation and also allow customers to fine tune their searches. Grouped and Bundled Products – Magento allows for complex grouped and bundled products. Grouped products allow you to display more than one product on a product page. Customers can add quantities of each available item to their cart on a single page. Think of building your own living room set: a full set would include a couch, a loveseat, an ottoman, two end tables and a coffee table; with bundled a bundled customers can pick and choose which items they would like to add to their set. Bundled products are a bit more complex. A bundled product acts as its own SKU, or its own individual product. Like a custom computer purchase, you can require certain pieces of the overall bundle, and also give options for components, i.e. Hard Drive: 500 Gig or 1TB, Processor i5 or i7, etc. All these options come together to make your single SKU “awesome-comp-005” product. SEO – Magento offers some great tools to help with SEO and analytics. You can easily create custom rules for page titles and pull special descriptions from products that serve as page descriptions. Landing pages and category pages are all set up to be SEO ready as well. Magento also utilizes canonical URLs so Google’s indexing is more keyword specific. There are a number of free and paid SEO extensions that can help make all of this even more robust. Multiple Languages – Magento also offers multi-language support. For popular languages, the language packages will translate close to 100% of your Magento labels making it easier to expand your e-commerce sales to a broader community. Email Marketing Integration – Magento offers several extensions that allow you to integrate your store contacts with email marketing campaigns through third parties. Out of the box, Magento works with MailChimp, a very popular email marketing service provider. 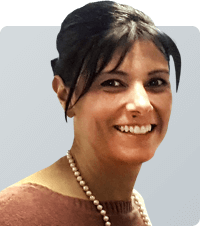 Help Desk – We like to include a help desk extension that makes it easier for your customers to contact customer service. This extension allows your customers to easily create tickets through their account dashboard and it tracks all correspondence, even via email, in a simple back-end interface. 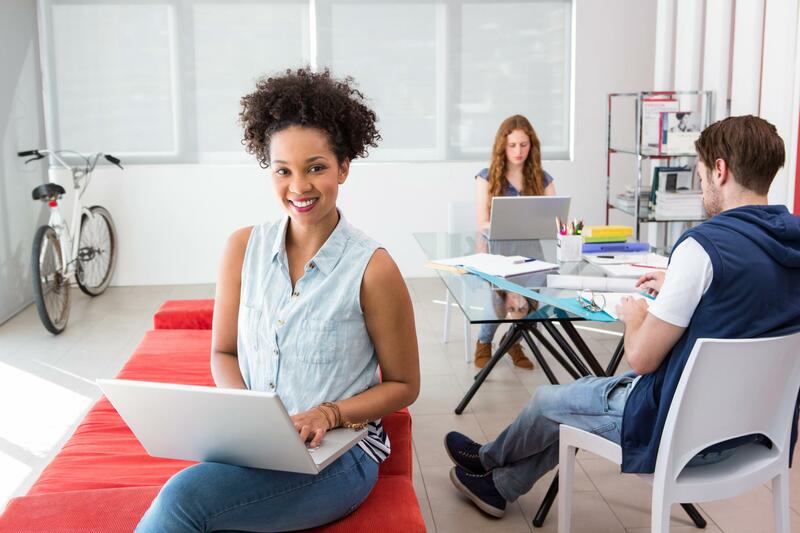 Your customer service team can set up custom ticket statuses and create departments which will make managing customer inquiries much simpler than managing them through emails or phone calls. Abandoned Cart Re-Marketing – Abandoned carts can often be recovered with a follow up email from the store. The extension we like to use can attach coupons to these emails to further help your customer make the decision to purchase. This extension can also be used to send emails for a variety of other reasons: birthdays, date since purchase, date since customer login, a customer group change… etc. WordPress Blog Integration – Integrating a blog into Magento is pretty simple. We take a new installation of WordPress and it automatically gets themed exactly like your Magento site. You have the blogging power of WordPress inside your Magento e-commerce site. 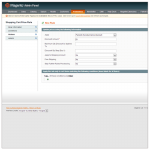 You can even one-click login to your blog through the Magento admin. Data Feed Manager – This extension is an essential. With a data feed manager, you have the ability to have your catalog listed on Amazon, Google Shopping, EBay, Shopping.com, Bing Shopping, Yahoo! Shopping and more. After making sure your feed is 100% optimized it will run automatically and can be set to add or remove items based on a number of different rules. As your prices change and you cycle through inventory, your feed will always stay up to date with your current store catalog. 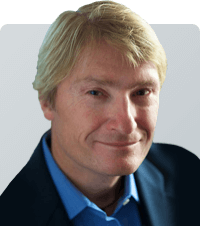 Advanced Gift Cards – Selling, tracking and generating gift cards online is more complicated than it sounds. This extension makes them easy to manage and is a great add on to Magento’s native gift card functionality. With all these features, it’s easy to see why Magento has quickly climbed the ladder to compete with other leaders in e-commerce technology. Without much customization Magento offers a strong set of tools that will help take your online store to the next level. 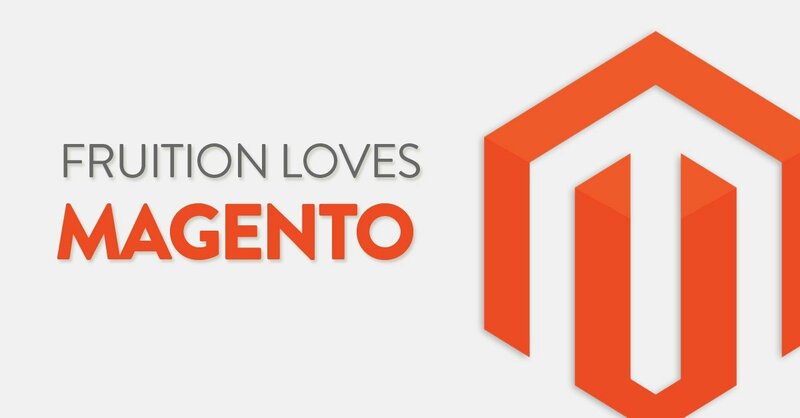 Fruition can help you make your move to Magento by assisting in planning your catalog architecture, creating a cutting edge design, optimizing your products and pages for SEO and developing an e-commerce site that will keep you and your customers happy as your store continues to grow.